Today I’m going to show you how to make the CUTEST “Coconut Drink” Cakes! With LUAU parties in full swing all summer long, I thought that it would be fun to add another idea to your list! Both kids & adults are sure to love these festive little cakes. I know that I say this a lot, but these mini cakes are SO easy to make!! Trust me, they really are. I tried making them for the first time today and was so happy that the final cakes matched the picture that I had in my mind–whew! I love it when that happens! 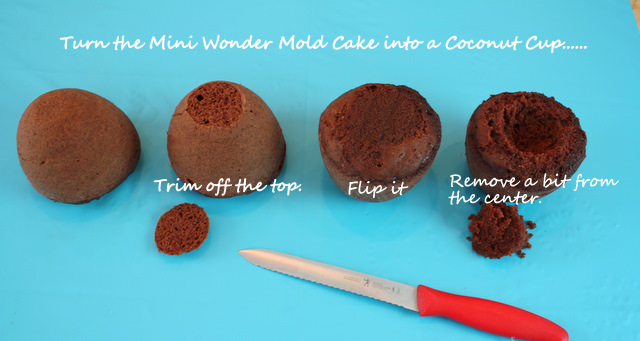 To make the coconut drink cakes, I used my Wilton Mini Wonder Mold pan–(each pan makes 4 little cakes at a time)– but I bet chocolate cupcakes would give you a really cute result too. So, here we go! For each individual cake, you’ll trim off the small point so that you can then flip it and it will stand on it’s own. Then hollow out a depression. You can see in the photo that I first outlined the cake (using a wilton 12 medium round tip) and filled it in with buttercream. Of course, if you aren’t working with a crusting frosting, just remove the excess frosting with your spatula and smooth as best you can. This is a forgiving design! Now it’s time to add a little color! This is my favorite part. I added simple flowers using a tip 104 for the pink flower in the photo and a tip 81 for the yellow! Have fun experimenting with different colors and flower designs. You really can’t go wrong. 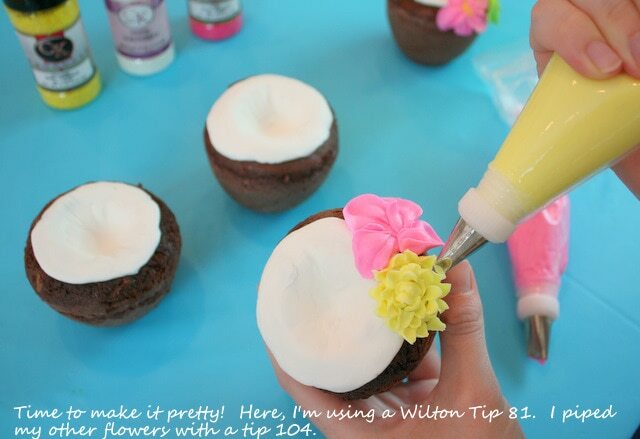 For these cute coconut drinks, every brightly colored flower makes them look a bit more tropical and festive! Now, for the final details! I picked up some little umbrellas and straws at our local party supply store (Party City) to really bring these cuties to life. I LOVE how these turned out, and even better, the design is so simple! Now, go find a palm tree to sit under and have yourself a nice coconut drink or two :0) Cheers! Thanks for stopping by! We hope that you’ll check out our full collection of Free Cake Tutorials as well as our Recipes Section filled with our FAVORITE tried and true cake, frosting, and filling recipes! « Fourth of July Cupcakes! Hi Alyson–Hmmm…good question. It seems like if your cupcakes have a good sized dome, you could flip them over (level off a tiny bit so they’ll be stable) and you’d wind up with a similar shape. It won’t be as tall…but I think you would get the point across! If you try it, let us know how it goes! Going to make these for my friends 40th Birthday. Did you have any issues with the cakes sticking in the pan? Any suggestions? How full did you fill the cake pans? Hi Jenni–No, I didn’t have any issues. Some people use Baker’s Joy or other nonstick sprays, but we just lightly grease our pans with vegetable shortening and lightly flour them. *You definitely want to prep the pan in some way before pouring in the batter. 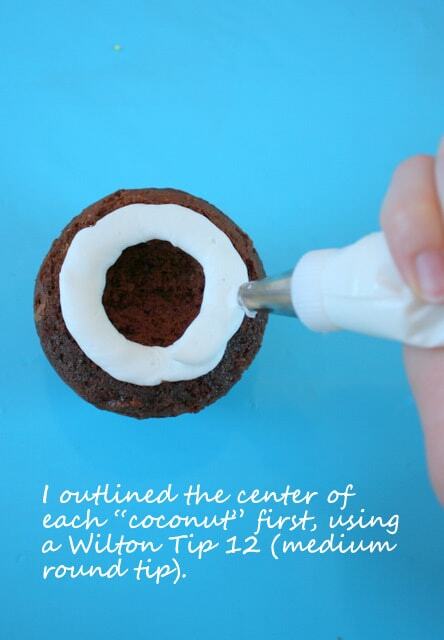 You can use an ice cream scoop or measuring cup to fill the cake pans. We usually fill approx 2/3 full. Totally cute. I just used a 50% coupon and bought this pan at Michael’s today. I am getting ready to make these and try my hand at the dolls too! Hey Dana–Great! I think you will like them. So cute! wht do you serve them on? Cupcake wrapper? We serve on a dessert plate, no cupcake wrapper. I just made these tonight. They came out really cute. Even though my flowers are not as cute as yours. I added rum emulsion to the cake batter, and coconut emulsion to the butter cream. They are delightful. I received that cake pan nearly a year ago. I have yet to use it. These coconuts are a perfect way to break them in! I wonder if we could hollow it out a bit more and put a fruit filling inside before putting the butter creme on top. Flavor the butter creme with coconut extract, perhaps? I noticed in the picture the outside of your cakes all have a “crust” on them. Did that happen naturally when baking? Usually my cakes are soft and moist on the outside? Any special tip to create that “crust”? Just tried to make these today and mine did not turn out good :( Cakes turned out dry and fell apart when I tried to “shape” them. Which chocolate cake & frosting recipes did you use? Thanks. Hi Prisca, I am sorry you had a problem with these. We used the Chocolate Sour Cream recipe (a doctored cake mix recipe). this is the cutest idea!! loved it!!!?? ?thank you so much for sharing??? I love it! It’s such a cute and great idea. I hope I get a chance to do them soon. It’s exactly what I’ve been looking for. Thank you! Hi Brenda, Thank you for your nice comments! 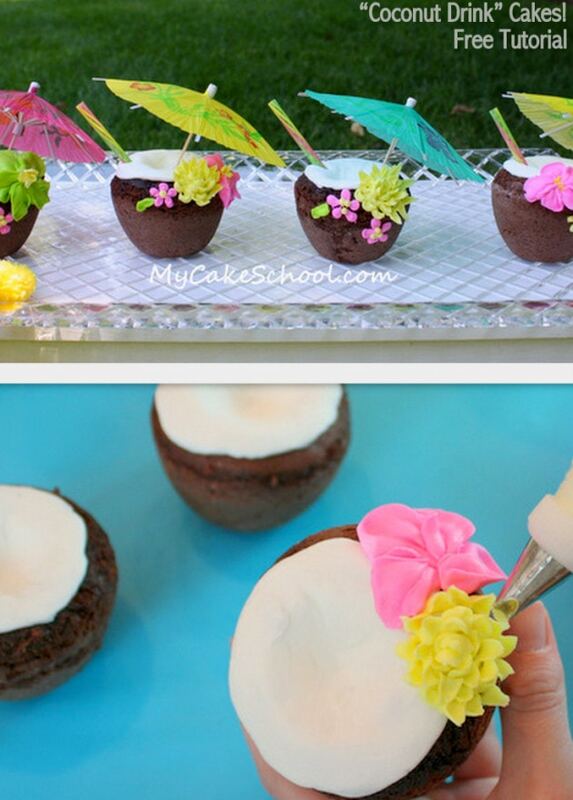 They are good summertime or luau party cupcakes. How do you store these? Do they dry out? I got the pan. The cakes look like they will be large but your pictures look more cupcake size? I need to make them for a party this weekend and am wondering how to start!? Hi Christine, If you are worried about them being too large, you do not need to fill the pan as full as you normally would. 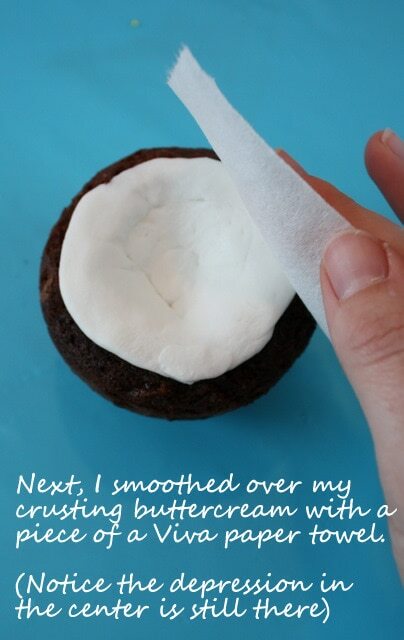 If too large after baking, you could also trim them down. They are larger than cupcake size. Store in an airtight container to keep from drying out. Since the pan has only 4 wells, you can bake in advance and freeze. Place the baked cakes on a cake board or in a pan, double wrap in plastic wrap then aluminum foil and freeze. You can decorate while still partially frozen if you like, then store in an airtight container. 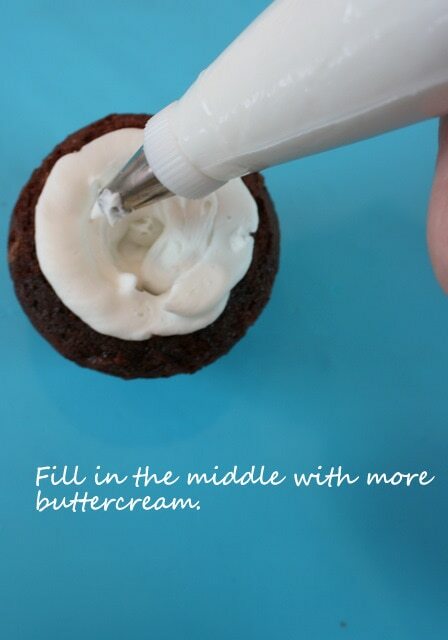 The frosting that will be on the cakes also helps to keep them moist. Hope all goes well. Thanks for replying so fast! I have 12 coconuts and another dozen cupcakes to just frost! I can’t wait to finish them! Just curious have you ever hard shelled them to keep from drying out? Hi Christine, we have never hard shelled them. Do you have a chocolate shell recipe that you think would work well and not get too soft once it is out of the refrigerator? I do think that these will be fine if kept air tight.